On the Olympic site, South African Neville Gabie has been making his presence felt as the official Olympic artist in residence. Gabie, who studied in London, produced a variety of artworks and projects during his 15-month residency, responding to the physical changes of the site and the huge range of jobs, skills and personalities that have delivered the project. One of the most remarkable is a re-interpretation of a National Gallery painting by Georges Seurat, the pointillist masterpiece Bathers at Asnières. 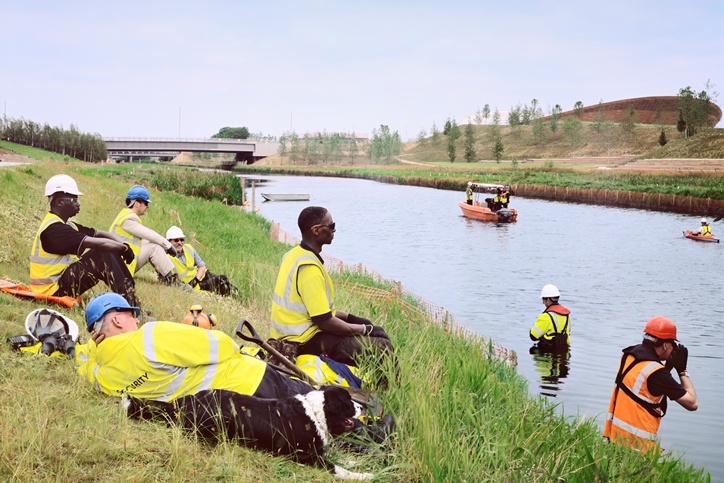 The modern photograph, entitled Freeze Frame, recreates the 1884 pointillist painting’s composition, with the characters inhabiting the image taken from across the Olympic Park, including landscape gardeners, engineers, designers and security staff. The image reflects the range of tasks, diversity and skills of those delivering the venues and infrastructure ahead of this summer.